We have talked about Rheem several times before, and we’ve included a ton of their products in our reviews. So naturally we thought it was time to introduce you guys to the brand! Rheem was founded by the brothers Richard and Donald Rheem in 1920, and they have been making quality water heating products ever since. 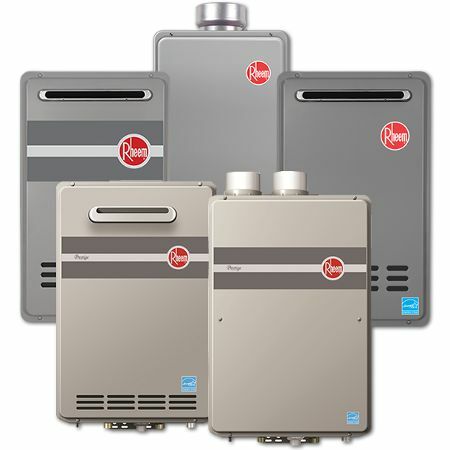 Today, Rheem is one of the most authoritative brands in the water heating industry and their tankless water heaters are some of the highest quality tankless water heaters on the market. They are praised for their reliability, performance and longevity. It’s very easy to see that Rheem puts a lot of energy into creating solid tankless water heaters. Their tankless water heaters are of high quality. However, the price tag is and always has been fairly steep. Floating around $500-$1400. It’s a significant investment for most people. So, the question we want to answer is: for people who have access to dozens of other tankless water heaters from just as many manufacturers, are Rheem tankless water heaters worth the price? Let’s find out. When it comes to tankless water heaters, Rheem is probably one of the most legendary. Their long years of expertise and technical competence is built into every water heater they manufacture. Rheem offers a huge array of tankless water heaters for every purpose. Whether you’re looking for an electric or gas tankless water heater for your vacation home with multiple showers, or for the appartment you’re living in or even for your large home which requires a great deal of hot water, Rheem has you covered. Rheem features two lines of tankless heaters: the Professional and the Performance Line, with the latter being available only in U.S. Regardless of which Rheem tankless water heater you decided opt for, you’ll certainly be pleased with their compact design which allows for easy installation. Rather than a big, bulky water tank, Rheem tankless water heaters are usually flat and can fit almost anywhere without getting in the way. While most Rheem tankless water heaters boast high energy efficiency and are ENERGY STAR® rated, we’ve found that many of them require a much higher gas flow supply than most tank water heaters. This is counter intuitive; why should a more efficient appliance take more fuel than a less efficient appliance? Well, the reason is that these tankless water heaters must heat the cold water very quickly, in just the few seconds that the water is flowing through the heater on its way the the hot water tap in your house. Having said that, you might need to upgrade your BTU meter. The Rheem RTGH-95DVLN is one of the best natural gas tankless water heater that Rheem has to offer. All things considered. Most importantly this unit is rated for 9.5 gal/min at 35 degree F rise. And even at higher temperature rise, it can still provide enough hot water to fulfill all your needs. 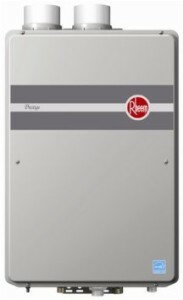 Rheem Prestige™ RTGH is a series of high efficiency condensing tankless gas water heaters designed and built from the ground up with quality in mind. The RTGH-95DVLN unit features a digital display that shows temperature setting and diagnostic codes as well as a digital remote control. It’s also fitted with various intelligent electronic controls designed to increase energy efficiency and safety. The only downside I can reasonably think of is its fairly steep price tag. Obviously, these water heaters cost an arm and a leg. If you want to go balls-to-the-wall and actually purchase one of these units, you’ll be looking at a $1000-$1200.However, you’ll be getting a solid tankless water heaters that will last you a very long time. 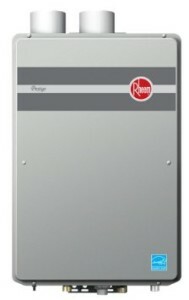 The RTE 13 is one of the Rheem’s best selling electric tankless water heater in the market. This tankless water heater unit is best suited for low flow applications such as condos, medical offices, boats, offices, laboratories … etc. It’s also perfect for point of use applications. It provides a maximum of 2.54 GPM continuous flow at a 35°F temperature rise. 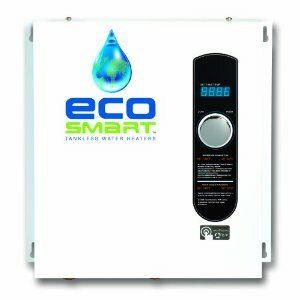 If you are on a tight-budget and looking for a reasonably priced electric tankless water heater, then look no further than the RTE 13. It’s one of the best tankless water heaters under $200. We’ve come across a ton of you who have used and loved this unit. The RTE 13 features a ultra-compact size (9 x 10 x 5 inches) – it can fit almost anywhere and it will save you valuable space. Additionally, it will cut your electric bill substantially as it’s energy efficient. The brother of the RTGH-95DVLN, the main difference between the two is that the RTGH-95DVLN is gas-powered while the RTGH-95DVLP is propane powered. We’re not going to get into the debate about which is better; they both clearly work, and it really boils down to personal preference. Both, the gas and the propane versions come with the same features and performance. They are also about the same price. 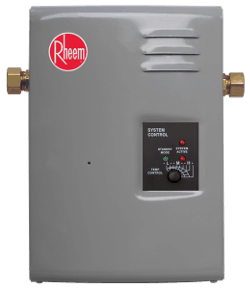 The Rheem RTGH-95DVLP is one of the best propane tankless water heaters out there. It’s another expensive one, but again, it’s very well-engineered and would be a great investment for anyone who’s looking for a solid propane-powered indoor tankless water heater with a high GPM.